For 15 days, miner Lindsay P. Hicks lay trapped by a cave-in that killed his five companions tunneling in a mountain above the Kern River for an Edison hydroelectric project. On the 16th day, crews finally cut through the last of the steel and scraped away rocks and debris to free the man who had been kept alive with gallons of milk poured down a 60-foot iron pipe. 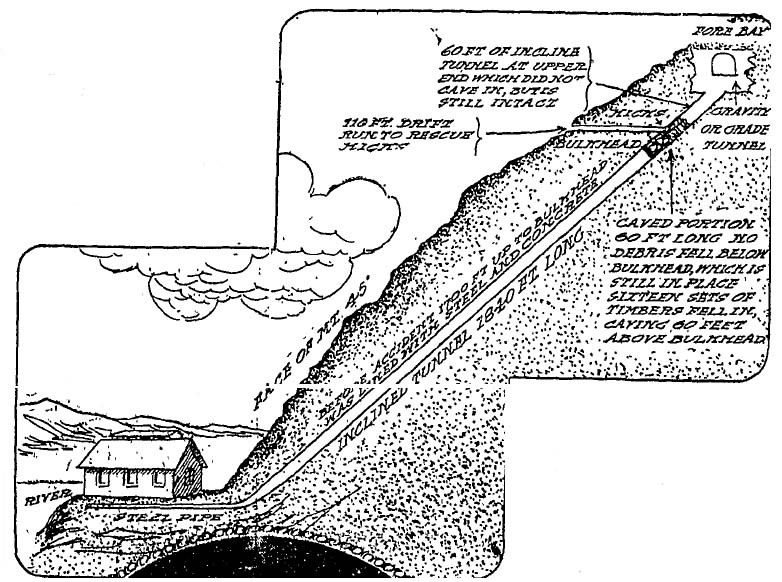 At first, Edison officials assumed that no one survived the collapse of the tunnel. 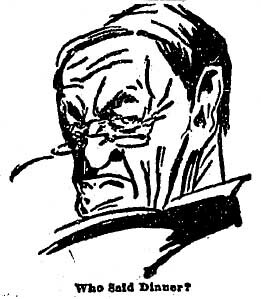 Then someone heard the faint signal tapped on one of the steel rails for the mining cars: the code for “trapped miner.” The iron pipe was driven through the side of the mountain to provide air and food as Hicks lay either under a rail car or next to it, sheltered by a pile of collapsed timbers that prevented him from being crushed. The painfully slow rescue was hampered by the mountain’s decomposed granite, which collapsed like sand, The Times said. To buoy Hicks’ spirits, a phonograph was placed next to the pipe and records were played for him, interspersed with jokes and stories told by men on the surface. The stench of the dead miners’ decaying bodies wafted up through the tube and Hicks complained of fighting off rats that scampered over him. Then, at 11:23 p.m. on Dec. 23, Hicks was freed. “The last cut on the second rail was made at 11:12 and no sooner was the section removed and the way left open than Hicks began to scrape away the rocks and dirt and crawl toward the opening,” The Times said. On New Year’s Eve, Hicks went into show business at the Elks Hall in Los Angeles, but the subject of the heroic rescue was a terrible disappointment. “The reporter who quoted Hicks as shouting tidbits of Shakespeare up the pipe to his rescuers has an awful lot to answer for in the next world,” The Times said. Displayed on stage were Hicks’ well-worn pants from his ordeal, his shoes and a piece of the pipe that was his lifeline. “Hicks occasionally glared resentfully at them out of the corners of his sunken eyes as though he held them responsible for getting him into this. Unwilling to describe his 16 days underground, Hicks answered questions from the audience. Was he able to shave? The fellow Kentuckian invited Hicks to New Year’s dinner. Hicks was displayed at several local theaters, appearing in Pasadena and at Chutes Park. The Times says he threw out bushels of post cards and mash notes from young ladies, some that came in the mail and others that were shoved under the door of his room. 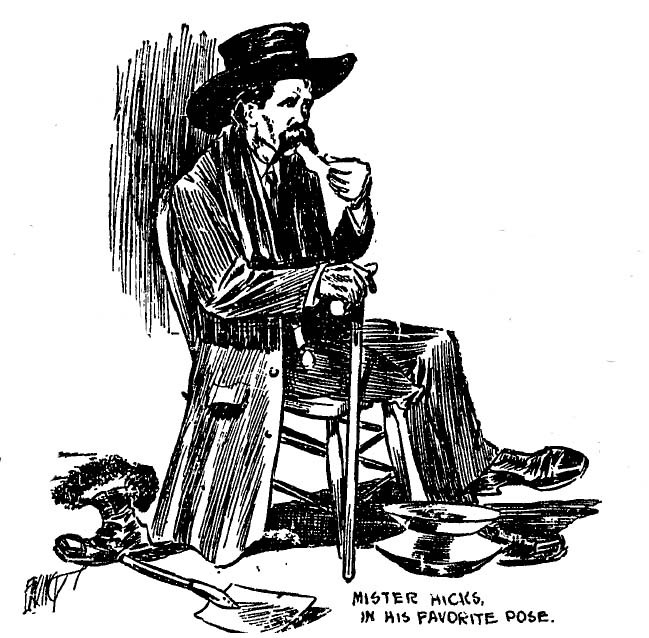 After an appearance in San Jose, where he was kissed by “an elderly and sentimental damsel,” Hicks swore that he was going back to mining. “Give me my little old $3 a day and a pick and shovel and I’ll be satisfied. I’m going back to Bakersfield—and honest work,” he said.